When autumn arrives and it gets cold and rainy, I often practice an “instant vacation” routine in my mind by thinking about summer, warm weather and past vacation adventures. It’s a quick and easy way to brighten up a gloomy day and it surely brings a smile to my face. The summer of 2018 is especially effective for my routine as it was chock-full of wonderful places and unforgettable moments. Never before did I have an opportunity to travel for six straight weeks and explore wondrous places with my family. We travelled all around the beautiful country of Croatia, magical Adriatic coast, and even Vienna, Austria. It was great to see family and old friends, as well as meet new ones. 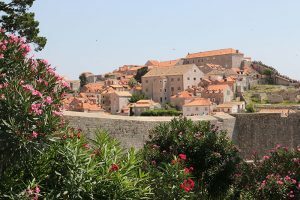 Naturally, one of the stops in Croatia was the coastal city of Dubrovnik. Known as, “the Pearl of the Adriatic”, this fort city was established in the year 614. 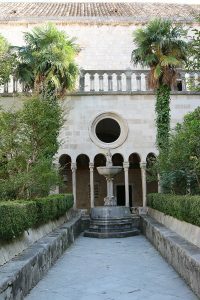 To its tourists, Dubrovnik offers marvelous history, captivating stories, and incredible natural vistas. 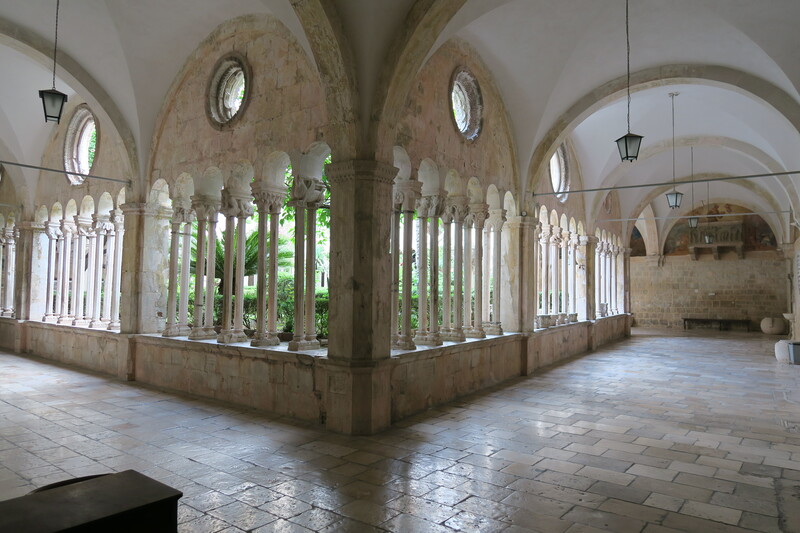 One place that easily encompasses all three offerings is the Franciscan Monastery of the Friars Minor. 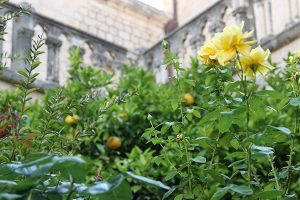 Dating back to 1317, the monastery houses the world’s third oldest apothecary, the library with 70,000 books including 1,200 rare manuscripts, and a beautiful cloister garden. As the source of my inspiration for Sage Abbey, I’ve visited the monastery multiple times before. 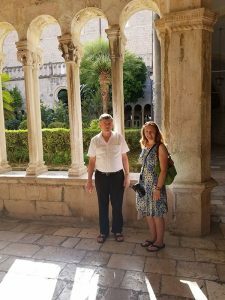 However, this time it was extra special as I also got to meet Fra Stipe (or Friar Stephen), an incredible historian and a great story teller, who also serves as the monastery’s provincial vicar. In 2017, Fra Stipe published a book to commemorate 700 years of the apothecary. 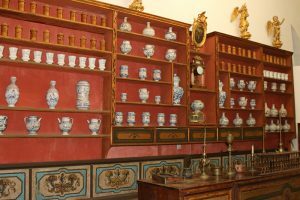 In this book, he shares historical details about a variety of artifacts also displayed at the apothecary museum. 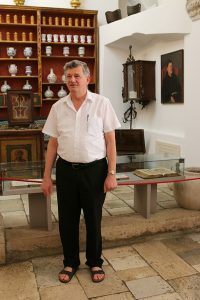 Fra Stipe was a gracious host who took time to guide me around the museum, share historical facts and several anecdotes, as well as grant me the special opportunity to take photos. Growing up, I became aware of the Franciscans’ profound contributions to our world, especially in the fields of pharmacology and medicine. It turns out even the world renowned Mayo Clinic has Franciscan roots. I long admired their detailed knowledge of nature, botanicals, apothecary crafts, and most of all their desire to help people in need, regardless of their religion, gender or nationality. As the Franciscans remain humble souls who respect all living things and selflessly offer help to those in need, it’s no wonder so many people throughout history sought and found refuge in their establishments. Their simplicity and goodness builds trust in humankind, and being in their presence made this visit an amazing, humbling and definitely unforgettable experience. Follow @thesageabbey on Instagram and Facebook as I reveal more photos from this epic trip. The cloister fountain in the beautiful garden, no wonder this place is inspiring!